John Van Surly DeGrasse was a commissioned physician with the Union Army during the American Civil War and was the first black to be admitted to a United states medical society. He was born in June 1825 in New York City, New York to Count George DeGrasse and Maria Van Surly. In 1840 at the age of 15 DeGrasse enrolled in Oneida Institute in New York. He later studied medicine at Aubuk College in Paris. De Grasse received his medical degree with honors from the Bowdoin College’s Medical School of Maine in Brunswick in May 1849. With his graduation he became the second African American to receive a medical diploma in the United States. After graduation DeGrasse returned to Paris and practiced medicine with the famous French surgeon, Alfred A.L.M. Velpeau, returning to the United States in 1851. On August 5, 1852 DeGrasse married Cordelia L. Howard in Boston; they had a daughter, Georgiana Cordelia DeGrasse, on December 5, 1855. In 1854 Dr. DeGrasse established his practice in Boston, Massachusetts and on August 24th of that year he was admitted to the Massachusetts Medical Society, becoming the first African American to be admitted to a United States medical society. DeGrasse was also a very active abolitionist and helped organize vigilante groups to intercept slave hunters in Boston immediately after passage of the 1850 Fugitive Slave Law. 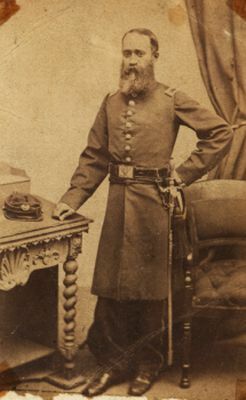 In May 1863 DeGrasse volunteered for the Union Army and in September he received a commission as assistant surgeon with the 35th United States Colored Infantry, one of only three African American physicians to do so. He was the only black surgeon to serve in the field with his regiment in South Carolina and one of only eight to serve in the Union Medical Corps. After the war DeGrasse returned to his practice in Boston. He received a gold-hilted sword from Massachusetts Governor John A. Andrew in appreciation of his service during the conflict. John Van Surly DeGrasse died on November 25, 1868 in Boston from unknown causes. He was 43. Jill L. Newmark, “Binding Wounds and Pushing Boundaries: African Americans in Civil War Medicine,” U.S. National Library of Medicine National Institutes of Health (2010), http://bit.ly/u6lIvy; R. B. Baker, et al, “African American Physicians and Organized Medicine, 1846-1968,” Journal of the American Medical Association, v. 300, no. 3 (2008); “DeGrasse-Howard Papers, 1776-1976,” The Massachusetts Historical Society Library Collection Guides, http://www.masshist.org/findingaids/doc.cfm?fa=fa0153; Robert G. Slawson, Prologue to Change: African Americans in Medicine in the Civil War Era (Frederick, MD: National Museum of Civil War Medicine Press, 2006).